Yesterday was my Dad's 50th birthday. I had the Inter-Club Christmas Ball on Wednesday night so my parents picked me up from my house in Uxbridge yesterday morning, and we drove to the Celtic Manor in Newport, a 5* golf and spa resort, where the Ryder Cup was held in 2010. We were just staying there for a night, it was just a chance for us to all get away together for a nice relaxing day or two. We got there at around lunchtime, and immediately you can see why this place is 5*. Unlike most places our rooms were already ready for us, so we went to drop off our stuff and explore a bit. We had two Resort Superior rooms with a balcony, and they were both beautiful. They had everything you could need, comfortable beds, desk, sofa, chair, TV, and a large marble bathroom with a separate shower and bath. The bathroom was also full of Elemis products! After exploring the rooms we headed back downstairs for some lunch in the bar. We had quite a long wait, and service was slow, but when we eventually got our food it was delicious! We just had sandwiches with some chips, but they were really tasty. We then went to the spa for a swim. It was A-mazing. The changing rooms were lovely, very clean and spacious, and in the women's changing/shower area you then have a spa area just for women, which includes a jacuzzi, steam room, sauna and cold plunge pool. After using the spa facilities my mum and I went into the unisex swimming pool area to meet my dad and brother, where there is not only a large pool but also a huge jacuzzi and another sauna. After a couple of hours relaxing and unwinding we went to explore the rest of the hotel. It's huge! There isn't just the Resort, there's also a smaller hotel called the 'Manor Hotel', just down the hill, which you can actually get to via a number of escalators inside the Resort. It felt a bit like going through secret tunnels...the entire way down was deserted. Obviously the Manor Hotel wasn't in use, because it was empty and a lot of it was closed. Maybe they use that hotel for the Golfers?! Anyway, we had a wander 'round and it was very traditional, old rich woods and it all felt very Celtic compared to the more modern Resort. The dinner we were very disappointed with. We got dinner included with our room rate, and were told that we could only eat at the Olive Tree restaurant. My mum asked a couple of times if we couldn't eat at one of the nicer restaurants, and they told us no. So off we went to the Olive Tree. It was a buffet, and a very badly laid out buffet at that. The restaurant was incredibly hot, there was absolutely no air, and it was incredibly busy what with people staying there for Christmas. You literally couldn't even see the buffet there were that many people and it took forever just to get your food! The service was very poor, incredibly slow...took forever to get us new cutlery, water, and clear our old plates away. I was also shocked that we had to ask them to keep re-filling the jug of tap water, at a 5* hotel you expect the restaurant staff to be trained to an adequate standard and be taught the basics that you always re-fill the water jug before it's empty, not half an hour later! The buffet food was nice, nothing special, but the problem was because it was so hot you didn't feel like eating much. It definitely wasn't special enough for a 50th birthday dinner. 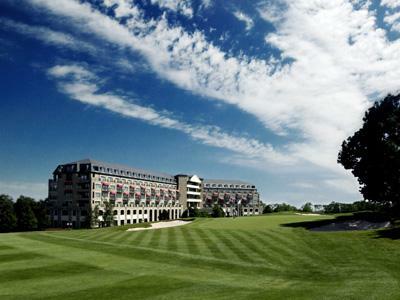 The Celtic Manor Resort is beautiful. It definitely wasn't the best hotel we've stayed at, but the staff were very friendly, even if the service was slow. I guess it was good just for one night and just for some time to relax and unwind. I'm not sure it deserves its 5*'s though, I'd say it was more of a 4*. The spa and swimming pool was definitely the highlight of the stay. Unfortunately we don't play Golf, my Grandad does that enough for all of us, so we couldn't test out the golf course...but it must be good if they held the Ryder Cup there?! I also loved the fact that the hotel was so festive, they had Christmas trees everywhere, including a large one in the middle of the lobby with a huge train set going around it. The breakfast was also very tasty (again, a buffet) but again, service was slow. So reagarding the buffet - were the staff standing around being slow, or did you see perhaps they were busy but not enough people? It might be a management fail not a staff fail. It was the staff. They definitely had enough people, but they were all standing around doing nothing and talking to each other instead of serving the customers!